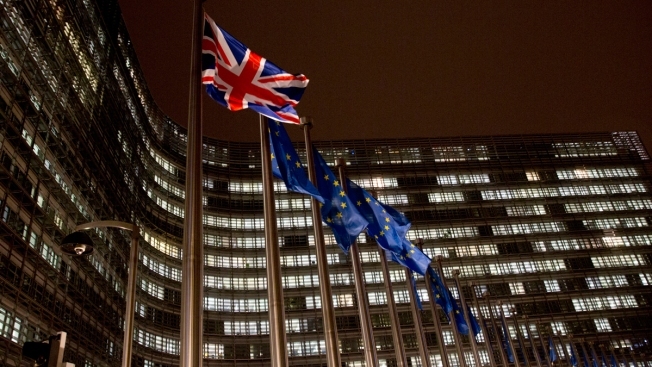 A Union flag, left, flaps in the wind alongside EU flags in front of European Commission headquarters in Brussels, Wednesday, Nov. 21, 2018. The European Union and Britain have agreed on a draft declaration on the future of their political relations after Brexit, European Council President Donald Tusk said Thursday, paving the way for an EU summit this weekend to rubber-stamp the deal. The draft declaration was agreed upon at a technical level by negotiators and endorsed Thursday by the European Commission, the EU's executive arm which is overseeing Brexit negotiations. "The (EU) Commission President has informed me that it has been agreed at negotiators' level and agreed in principle at political level," Tusk said in a tweet. Tusk, who chairs meetings of EU leaders, said that he has sent the draft political declaration to Britain's 27 European partners. He said the draft declaration still requires "the endorsement of the leaders." EU heads of state and government are due to meet in Brussels on Sunday to approve the declaration and a separate divorce deal. Representatives from all 28 EU countries are due to meet Friday to prepare the summit, seen as a pivotal moment in the Brexit process. Britain officially leaves the EU — the first country ever to do so — at midnight on March 29, but a Brexit deal must be agreed on in coming weeks to leave enough time for the European Parliament and the parliament in Britain to endorse it. British Prime Minister Theresa May was due Thursday to meet Austrian Chancellor Sebastian Kurz, whose country holds the rotating EU presidency until the end of the year. 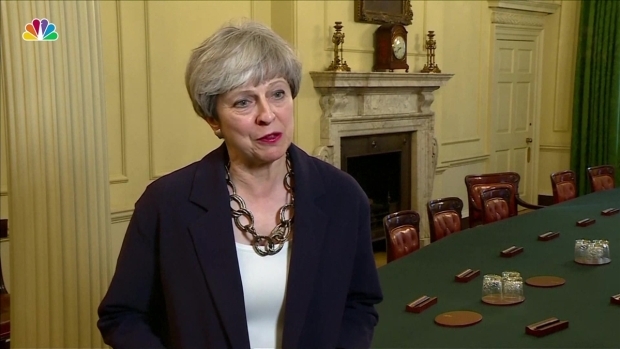 May is also set to return to Brussels on Saturday for more talks on the eve of the summit. The U.K. and the EU agreed last week on a 585-page document sealing the terms of Britain's departure. Kurz told the Austria Press Agency in remarks published Thursday that his trip to London is designed to help May build support for the deal, which faces opposition in the British Parliament. He also says he hopes to get a "realistic picture" of May's chances of getting majority support for the bill. Gregory Katz contributed to this report.